I haven’t actively looked for Yu Aoi fan-made videos in a long time, but here we go~ I hope this one doesn’t get deleted, coz we’ve been suffering from that a lot lately. Regular Yu Aoi film footage applies, with nice additions of Tamatama, and Otouto… though, Raiou would have been nice to have. Soooooo, story of my life. 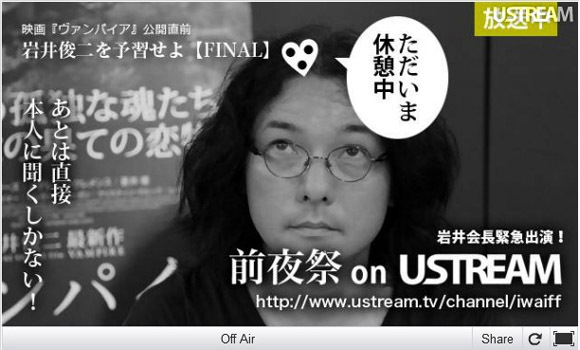 The Shunji Iwai Vampire interview was supposed to begin at 9pm, which means I decided to stay up all the way into 7am my timezone to catch the interview… the problem was I fell asleep well into the 30min. mark with Iwai-san arriving just a few minutes later. I really don’t know how I missed this trailer. I mean, it’s got Yu-chan’s line in ENGLISH… broken English, but HER LINE IN ENGLISH. And it’s nearly a year-old video post, and I never knew. And NOBODY told me. T_T That’s the most depressing part. I had talked with people who had seen Vampire already, and they’ve told me that Yu-chan’s part is small… but memorable (but maybe they’re a little bit biased). In any case, I’m not guiding myself by the reviews that came from Sundance because most of them… they were expecting some other movie about vampires. I’m posting this today, because Vampire just got a Japanese release date — September 15th this year — but i can’t find an upload for that version on YouTube, so here’s a link to Wildgrounds.